The U.S.-Russia relationship is facing another setback as Russia has turned off the Voice of America and the American Councils, a U.S. education NGO, has been ordered to suspend its activity in Russia. Against the backdrop of the standoff over Ukraine and the rapidly deteriorating level of trust between the U.S. and Russia, both sides are now making moves to curtail the level of bilateral collaboration at all levels. The latest victims of the standoff appear to be government-funded media and educational organizations from the U.S. working in Russia. Just consider some of the recent moves from the Russian and American authorities. Russia’s refusal to renew the AM broadcasting license for the U.S. radio station Voice of America (VOA), funded by the U.S. State Department and administered by the Broadcasting Board of Governors (BBG), is not just another sign of the state reshaping Russia’s media landscape. It also points out the plight of U.S.-Russia relations. James Brooke, the former chief of the Voice of America bureau in Russia and an American journalist working in Cambodia, sees the shutting down of Voice of America’s AM frequency in Moscow as symbolic. Brooke warns against a tough response by the U.S. Congress. According to him, it might find a way to shut down the RT news bureaus in the United States. It’s the same case with American Councils, a U.S. education NGO that deals with cultural and academic exchange that is now facing problems with its registration. As The Moscow Times reports, Russia’s Justice Ministry has ordered the Russian branch of American Councils to suspend its operations. Not surprisingly, this has resulted in controversial reaction from experts and journalists. 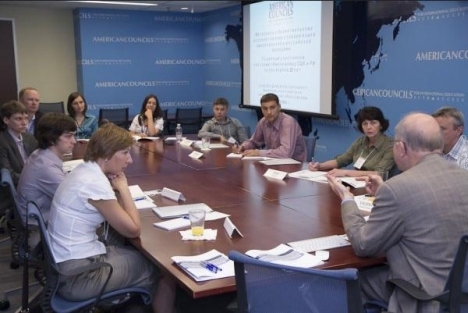 American Councils has been implementing different educational exchange programs for 40 years and it has always followed the rules and Russia’s regulations, according Carter Johnson, director of the American Councils for International Education in Russia. American Councils will apply for re-registration with a structure and set of activities that comply with the advice and counsel it has received. “This year alone, 600 U.S. students and scholars are studying Russian language and culture at leading institutions across Russia along with other areas of academic interest, while approximately twice that number of Russian students and young professionals are perfecting their English, studying at U.S. institutions, or developing professional networks in the U.S. on American Councils-administered programs,” American Councils President, Dr. Dan E. Davidson, who is an elected member of the Russian Academy of Education, told Russia Direct. At the same time, recent moves from the U.S. government also indicate that it is losing interest in constructive dialogue with Russia. A $30 million funding cut for the Fulbright Program and the closure of the Moscow office of the Kennan Institute, an academic outlet that fostered U.S.-Russia academic exchange and mutual understanding, seems to have come at the exact moment when U.S.-Russia relations are seeing a significant decline. And this political standoff is aggravated by recent public opinion polls showing a growth of anti-Americanism in Russia and anti-Russian sentiments in the U.S. According to the latest Gallup poll, the number of Americans who view Russia as an enemy increased from 60 percent this February to 68 percent in late March. Meanwhile, the number of those who view Russia favorably decreased from 34 to 26 percent. Vox Pop: Does Russia have friends or enemies? At the same time, Russia’s Levada Center poll, published in late March, says that anti-Americanism in Russia is growing amidst the recent events in Ukraine. For example, the number of Russians who view the U.S. unfavorably jumped from 44 to 61 percent since January. At the same time, the number of those who still regard the U.S. as a friend dropped from 43 to 26 percent. Victoria Zhuravleva, a Kennan Institute alumna and a professor of American history at the Russian State University for the Humanities, argues that closure or funding cuts in American organizations and funds in Russia is a result of the U.S. losing interest in Russia. According to her, this lack of interest became a looming trend after the collapse of the Soviet Union, “when the U.S. didn’t see Russia as a serious international player” and stopped a thorough study of Russia. “As a result, we lost the whole generation of American academics studying Russia who might have become highly-qualified experts and helped the Obama administration to shape a more balanced policy toward Russia, based on multifaceted approaches and understanding post-Soviet Russia, its authorities, society, and foreign policy,” she told Russia Direct. Dr. Dan E. Davidson stressed the need for both governments to do everything possible to protect educational and academic research programs: "American Councils is not empowered to speak on behalf of the U.S. government, but it would be wrong to reduce the U.S.-Russia relationship in 2014 to the specific set of disagreements that currently exist between the two governments,” Davidson said. “This is a time when our peoples should increase dialog and exchange of ideas regarding both shared interests and common challenges, rather than decrease them." What is behind anti-americanism in Russia? Read more experts’ opinions in the full version of the story at Russia Direct.